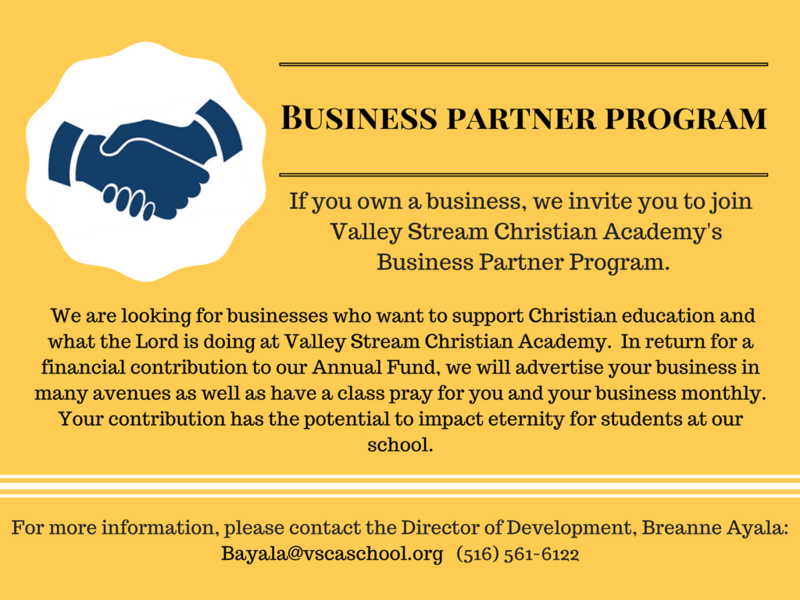 We are truly blessed and thrilled about the support our school receives from the business community and corporations that come along side Valley Stream Christian Academy (VSCA). Because of your generosity VSCA has created the Business Partner Program (BPP). Business Partners are businesses or corporations that provide monetary support and partner with us in achieving our goals for the future. Proverbs 11:25 says, “A generous person will prosper, and anyone who gives water will receive a flood in return”. Provides tuition assistance to our students—helping families afford something their children can’t afford to live without. This component will help with establishing a science lab. The school’s strategic priority is to provide better equipment and spacious classrooms. Business Partner Program brochure detailing information about the program. You can also have hard copy mailed to you by emailing bayala@vscaschool.org.